2015 is the year Marty went Back to the Future. CES (The Consumer Electronics Show) had over 160,000 attendees this year and I was one of them. It was my first time attending CES but of course this had to be the year to go. 2015, after all, is the year that Marty McFly went Back to the Future in the movie trilogy from the 80's. It is the year of the Hoverboard and Jaws 16 (only one of those is actually happening but it's still fun to think about). For techies it is a like being in a techy theme park - miles and miles of interactive displays with technology that is brand new and in some cases not even out on the market yet. The picture above is from the Rose City Comic Con although there was a Tesla at CES that could have passed as a time machine if it were silver instead of white. 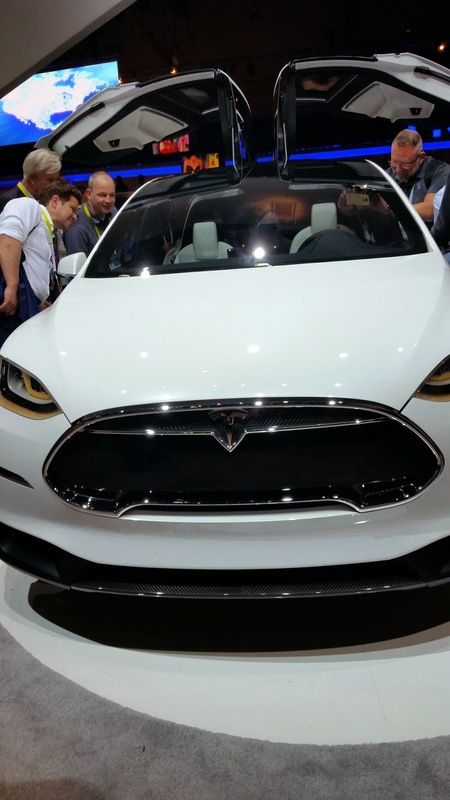 In the Tesla version there are 7 seats so you can bring some friends with you. But you don't have to be a tech nerd to appreciate CES*. On the first night there we spent time in the Gibson tent rocking out to live music being played out on the latest electronic Gibson guitars and equipment. With that many people attending CES and the entire city of Las Vegas being turned into an exhibit hall we had alot of ground to cover. After checking out a smidge of the primary exhibit hall and then heading over to the Gibson tent for a bit we walked on over to the Wynn hotel (which looked like it was just across the street from the Las Vegas Convention Center but is actually a few blocks away). The ShowStoppers event is a smaller event with smaller booths and single items being displayed. It was easy to get around the entire room and stop by and visit with some of our favorite tech companies and check out what is new on the horizon for their companies. I met up with other travel writers who were at the event as part of the #Techlicious team and we got a sneak peak at some of the very cool and very portable technology from Lenovo. For me going to CES was like learning math - you remember that moment when you finally understood how that one equation worked and from then on that particular math problem was easy. CES was like that moment for me. All of a sudden there was that "OH... Now I get it" moment. I have always loved technology and how it can bring families closer together but I didn't always understand why or how all of this tech would work together to make our lives more fabulous. Now I see clearly why I want a smart kitchen and a panasonic security system for my home and, well, more on that later. Even though I arrived in Las Vegas at 2pm and only took in a half day that first day my FitBit still registered over 18,000 steps that first day. Next year my first stop may have to be the new technology in very comfortable shoes. Techlicious and Travelingmom are going to have a wrap up Twitter party to talk about the best of CES and what that means for all of us in this year of Back to the Future. Join Travelingmom Thursday, January 22, for a special #TMOM Twitter party when we team up with our partners at Techlicious to chat about great travel tech, the joy and stress of working from the road and the cool tools that can help. They will be giving away some cool tech–some VERY cool tech–during the party. Check back daily for details on what you can win and how to enter. 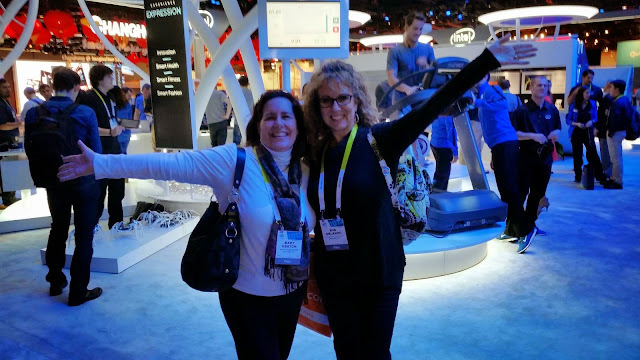 I was a guest reporter at CES at the invitation of Techlicious. Their entire aim is all about making technology easy to understand and incorporate into your life. I personally love their website because it takes the fear out of searching for (and understanding) new gadgets that will make our lives easier. Their website is organized in a way that makes it easy to search for exactly what you are looking for OR just scroll through for inspiration. So for me, Techlicious is all of the Tech with none of the Terror. I don't have to know how much RAM* I want in a laptop to be able find the exact information I need to be able to make an informed purchase. Even though I was a guest of Techlicious all of my opinions are always my own.